Klaipėdos Smeltė reported a record-breaking cargo throughput for 2018. The cargo turnover was up to 5.14 million tons which is an increase of 72% on a year-to-year basis. A big part of the growth could be accounted to the additional container volume MSC was bringing to the terminal. 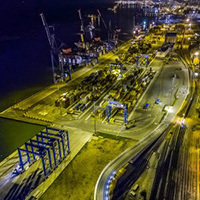 MSC is the mother company of Terminal Investment Limited (TIL) who is the major shareholder in the Smelte Terminal. With the additional import/expert and also transshipment volume the container traffic was up to 386.982 TEU in 2018. For many years Smelte is a customer of ours, running the RBS TOS solution TOPS Advanced. We are proud to be part of this success. Congratulations to the Smelte Team.